Flavius Julius Constantius II was the second son of Constantine I and Fausta. Constantius was born in 317 AD and given the rank of Caesar 324AD. He was named after his grandfather Constantius I Chlorus. Following the death of his father in 337 AD, the Empire was divided among the three sons – Constantine II, Constantius II and Constans. Constantius received the Eastern provinces as his share of the inheritance, which included Constantinople as his capital. In 340 AD, Constantine II invaded Italy in an attempt to conquer the territory of the youngest brother Constans. 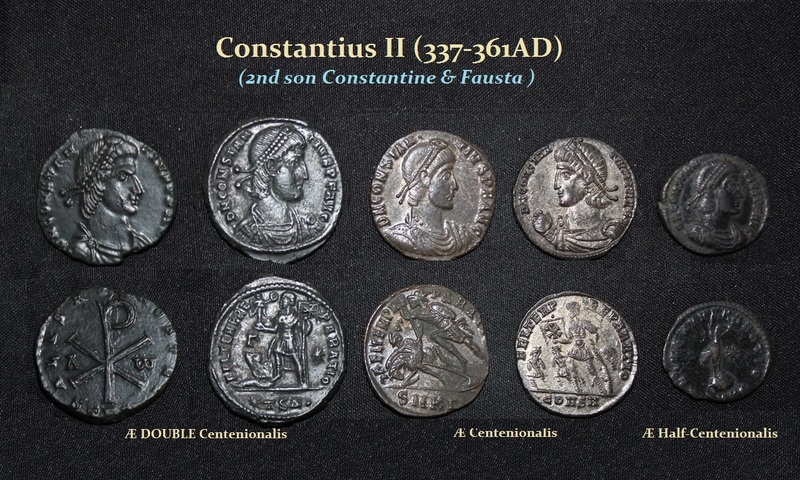 Nonetheless, Constantine II was killed and the Empire was then divided between Constantius and Constans. In January 350 AD, Magnentius led a rebellion in the West against Constans. With most of the Western legions defecting to Magnentius’ cause, Constans fled in the direction of Spain, but was overtaken and killed by Magnentius. With the Empire in chaos, Constantia (sister of Constanius II) persuaded the leader of the Balkin legions, Vetranio, to proclaim himself as co-emperor and to keep Magnentius’ legions in check until her brother arrived from the East. Vetranio complied and upon Constantius II’ arrival, Vetranio abdicated. Constantius then moved against Magnentius inflicting a major defeat in September 351 AD. Eventually, Magnentius was completely defeated in 353 AD. In 355 AD Constantius II had elevated to the rank of Caesar, the sole surviving male descendant of Constantius I and Theodora, Flavius Claudius Julianus. Julian was given responsibility for the defense of Gaul, where he distinguished himself as a good military leader. Fearing the popularity of Julian, Constantius ordered Julian to send his best troops to the East in support of the war against the Persians. Julian’s troops rebelled and proclaimed him Emperor while at his winter quarters at Paris in February, 360 AD. Julian strove to obtain recognition of his new status from his cousin Constantius, and continued issuing coinage in the senior Emperor’s name. However, Constantius would have no part of sharing the rule. In 361 AD, Constantius set out to meet Julian in battle. However, while he was advancing through Cilicia, Constantius became gravely ill and died at Mopucrene on November 3rd, 361 AD. Julian entered the gates of Constantinople unopposed as ruler of the Roman Empire. The House of Theodora had prevailed. Constantius celebrated the beginning of his tricennalia (thirtieth anniversary of rule) in the summer of 353 AD, though vows for its completion would have begun at the time of his twenty-fifth anniversary (348 – 9 AD). This was the final issue of silver units at the old Diocletianic rate of 96 to the pound of metal. About 357 AD Constantius reduced the weight of the silver coinage by one-third to 1/144th of a pound. This substantial reduction resulted in a new silver coin known as the “siliqua” with an average weight of 2.25 grams. The previously issued silver coinage that was in circulation thus became 1½ siliqua and the light miliarense now represented a double siliqua. Based upon the fact that silver coinage tends to become more scarce during this period in time, the above mentioned system of gold to silver relationship makes sense. However, it is also possible that silver siliqua of reduced weight may have been the equivalent of 2/3 of an old siliqua or 1/2 miliarense thus making it 1/36th of a gold solidus. In 348 AD, a new bronze denomination was also introduced known as the “centenionalis.” Due to the continued inflationary pressures, this denomination was discontinued by 354 AD and replaced by a reduced bronze denomination of about half the weight known today simply as the AE3.